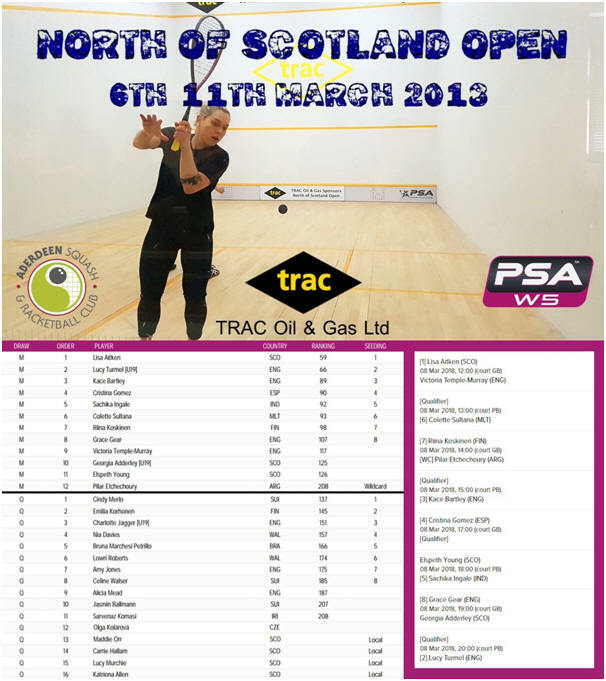 TRAC Oil & Gas North of Scotland Open, it was an all English affair as George Parker and Lucy Turmel claimed the men’s and women’s titles, respectively. World No.63 Parker defeated Belgium’s Jan Van Den Herrewegen in straight-games to clinch his sixth PSA World Tour title. Meanwhile, World No.66 Turmel secured her second PSA World tour title as she defeated compatriot Kace Bartley in straight-games in the final of the PSA W5 event. 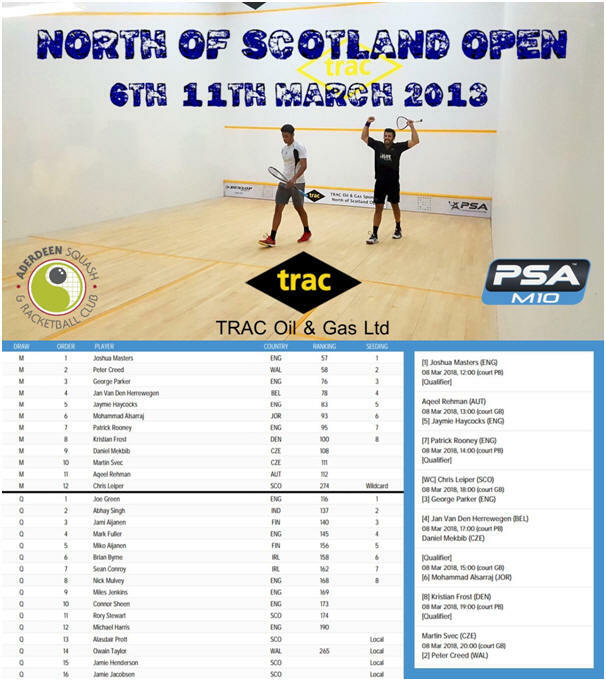 2018 will be the 5th anniversary of the TRAC Oil & Gas North of Scotland Open. This year it’s extra, extra special as for the first time we’ve been able to add a Ladies PSA W5 to our program alongside the Men’s PSA M10. The Ladies draw is headed up by Scottish no1 and Aberdeen local Lisa Aitken. Known as one of the best movers on the ladies tour, the former world no 38 is making a charge back up the rankings and will be keen to win on home soil ahead of representing Scotland at the Commonwealth Games on the Gold Coast in Australia in April. Hot on Lisa’s heels is world no 66 Lucy Turmel of Ipswich, England. 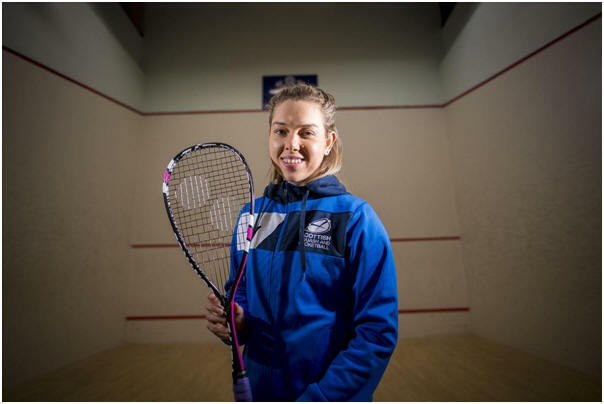 Lucy is just starting out in her professional career after becoming British Junior Champion and placing 3rd at the prestigious British Junior Open. Widely tipped to be a world-beater in the very near future, Lucy is mentored by and trains with former World Champion Laura Massaro. Others to watch in the draw are wildcard Pilar Etchechoury, the Argentinian no1 who is making her PSA debut, and Olga Kolarova of Hungary. Olga made it to world no 44 before taking a break from the PSA world tour and is now making a comeback. The men’s draw is very strong indeed, with the majority of the main draw players ranked inside the world’s top 100. The added bonus is that only 3 of the 11 main draw players have competed in the tournament previously which only adds to the buzz around the matches. Top seed is one of the few returning players and one we’re very glad has entered, the world no 57 from Kent, Josh Masters. 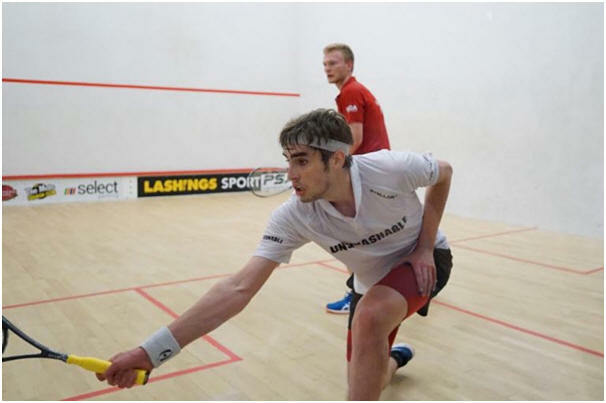 Ranked 119 in the world in 2016, Josh came through qualifying to play the top seed and then world no 43 Karim Ali Fathi. Josh ripped in nick after nick to take Fathi to a very nervous 5th game before eventually bowing out to the Egyptian’s relentless pace. In the 2 years since that match Josh has halved his world ranking and will be back looking to take down the whole tournament. 2nd seed is Peter Creed of Wales who is making his Aberdeen debut. Known for his outrageous speed, athleticism and commitment levels on court, Peter is one of the most entertaining players on the PSA World Tour. Ranked only 1 place behind Masters at world no 58, should they contest the final it’s sure to be a classic. England’s George Parker won’t let Masters and Creed have it all their way though. The talented world no 76 from Leicester only this week won the Bankers Hall PSA M10 in Canada. He also took former World Champion Nick Matthew to 5 hard fought games in the World Championships in December. Scottish interest in the men’s draw is led by Crieff’s Rory Stewart, who only just lost to Daryl Selby 10-12 in the 5th at the BSPA Edinburgh Open. 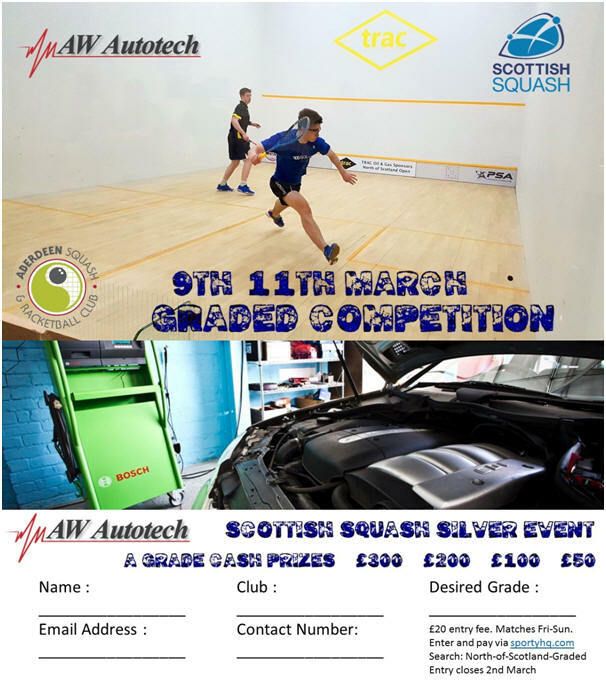 Other Scots in the draw include Inverness’ Alasdair Prott, the recurring Scottish Junior Open Champion, Thurso’s Jamie Henderson who will be no doubt refreshed after recently ‘retiring’ from the game, and Aberdeen local Jamie ‘Farmer’ Jacobsen.